What is it? 3D platformer starring Sega's long-suffering mascot. Sorry Sonic, but your once celebrated '90s attitude no longer seems charming. Maybe you wouldn't be in this mess if, rather than spending your life making quips and waggling your finger, you'd settled down into a real job with a proper pension plan. You could have retired with some dignity. Instead, you've been dragged out for another sub-par platformer. You're a tired, ageing lesson in the importance of financial planning and stability—if not for yourself, then for Sega. There are some things I like about Sonic: Lost World. It's a bright and vibrant game, and varied enough within its very specific design. It also features mercifully little of Sonic's annoying menagerie of friends. Tails is there, of course, and 'Eggman', but even Amy and Knuckles have relatively little screen time. Unfortunately, we get the Deadly Six instead—less characters than colours with a personality trait. One is purple and violent, another green and vain. They're awful. Remember Sonic 2's Metropolis Zone? This is like that, only worse. The Lost World in question is comprised of multiple tubes and small planetoids that Sonic runs across. Sometimes, to mix things up a bit, he runs inside them too. Other times, he must navigate a weirdly rotating 2D plane that features many references to Sonic's Mega Drive heyday—something of an inadvisable move, given the unfavourable comparison. Super Mario Galaxy was clearly an influence, except, instead of joy, Lost World's primary emotion is a sort of sad malaise. The moment the game asks for some finesse, everything falls apart. 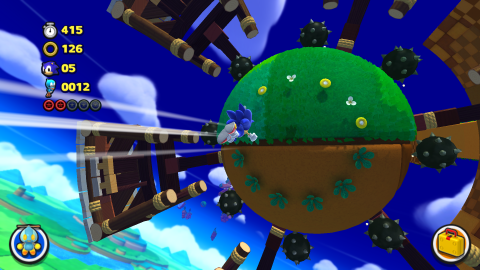 In each level, you lose control during interstitial transitions—the game playing itself for a few seconds as Sonic travels to the next island. These are the best bits. They look fluid and exciting, and always do exactly what they're supposed to. With a player in control, it's nothing like as smooth. For an ostensibly speedy hedgehog, Sonic has no precision in the air. This is fine during sections where all that's required is to go fast and avoid obstacles. The moment the game asks for some finesse, everything falls apart. To make up for Sonic's lack of aerial nimbleness, there's a double-jump and lock-on attack. Both are activated by pressing the jump button in the air, but the lock-on is inconsistent. It works most of the time, but not always. Double-jumping pulls Sonic out of his spin, so this can be the difference between doing damage and taking it. Things only get more arbitrary when you need multiple lock-ons, or a single, charged attack. The game recommends using a controller, but opens a menu screen when you click the left-analogue stick—the one that's used for movement. Wrench the stick in either direction as you attempt to cajole the sluggish blue ball into doing what he's told, and the game will instead pause to list its optional missions. There's parkour, too—although that word implies a level of grace and artistry that's absent here. It's activated by holding the sprint button, something that you'll almost always be doing because Sonic's default speed is painfully slow. Sprint directly into a wall, and Sonic will run up it. Jump against a wall that's parallel with you, and Sonic will run along it. Alternatively, he'll flounder awkwardly against the wall before dropping you into some deadly hazard. He can be fickle like that. On the main path, the parkour is rarely necessary, but each level contains alternate routes and secrets. If the game's freerunning wasn't an awkward, cack handed mess, these would probably be fun to find. It is, though, and so it's not. I admit: I enjoyed this bit. I like one level in Sonic: Lost World. In Desert Ruin, Zone 2, Sonic must run down a hexagonal tree because reasons. The gravity shift creates a sense of continuous momentum—letting Sonic bash through lines of bees, before quickly dodging through hives and across log sections. It's a one off. Everywhere else, Sonic's flow is continuously broken. It's difficult to know whether the game values speed—supposedly Sonic's raison d'être—or methodical exploration. The balance is trapped in the middle, rendering both options frustrating. By giving Lost World contextual traversal mechanics—from parkour to lock-on attacks—a game about fine, exacting movements is lumbered with controls that rarely do what you want. Of the many lives I lost, all too few felt like a result of my own mistakes. And that's just in the regular zones. Sometimes, Sonic's on ice—his already annoying imprecision made worse. I'm angrier about that than I am the melon thing. Should you buy Lost World? Maybe if you have a DeviantArt page dedicated to Sonic. Even then, probably not.